Often we mistakenly view astronomy as a static science — the distant universe is constant and unchanging, right? Not only is this mindset woefully inaccurate, astronomers can also prove it over timescales of only a few years. Take, for example, this stunning observation by the NASA/ESA Hubble Space Telescope. Astronomers have stitched together 20 years-worth of images of the spiral galaxy NGC 3862, which is located some 260 million light-years from Earth, and revealed a stunning relativistic collision inside the jet of material blasting from the galaxy’s central black hole. This is one rare time that such a jet, stretching thousands of light-years from the center of a galaxy, has been observed using an optical telescope. Normally, these jets are only visible in X-ray and radio wavelengths, a factor that is currently a puzzle to astronomers. The dynamics of black holes, particularly the mechanisms behind the powerful jets of hot plasma that are often observed emanating from active black holes, are largely a mystery. So when astronomers were able to create a time-lapse of NGC 3862′s central supermassive black hole, they were excited to not only see motion in those jets, but also bright knots in the jet material “rear-end” one another, causing a rapidly brightening “blob”. Energetic jets aren’t exclusive to black holes, however. Young stars also exhibit powerful jets of material blasting from their poles and these jets often show a “knotty” structure, not so dissimilar to the knots observed in NGC 3862′s jet. So to understand how these jets are generated and how the material within them interact could help us understand an vast array of energetic phenomena throughout the universe. 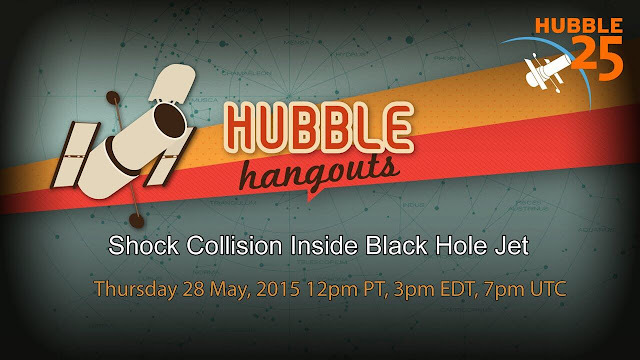 The brightening blob in this black hole case was caused by a “shock collision” where a knot of material, moving at close to the speed of light, caught up with another slower-moving knot in that jet that was launched earlier. 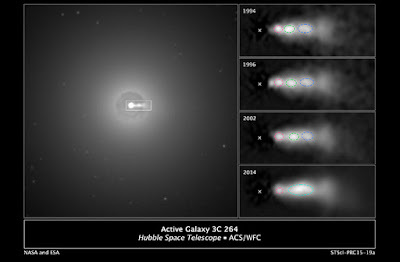 In the observations, the jets appear to be speeding away from the black hole many times the speed of light, but this “superluminal” motion is an optical illusion “due to the very fast real speed of the plasma, which is close to the universal maximum of the speed of light,” writes a Hubble press release. This is only the second time superluminal motion in an extragalactic jet has been observed. “The collision of outward moving components in jets has long been known, but this is the first time we actually see it happening,” said co-author Markos Georganopoulos, University of Maryland in Baltimore County.